For our May book club, we are reading a book so well-known it almost needs no introduction. Still, even a contemporary classic like The Omnivore's Dilemma deserves to be revisited, especially in light of how much impact it has had in the few years since it was published. It's on the book club agenda, in fact, because Linden Hills received so many requests to read and discuss Pollan's seminal work. 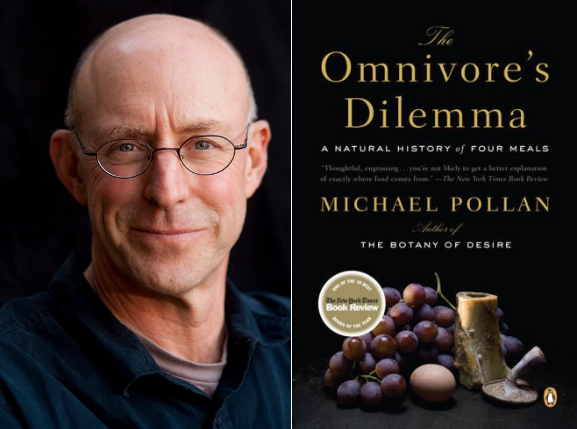 We will be meeting at the Linden Hills Co-op on Wednesday, May 29th from 6:30 p.m. - 8:30 p.m. to discuss The Omnivore's Dilemma by Michael Pollan. Since it was published in 2007, The Omnivore's Dilemma has had a huge influence on the way we think and discuss the sustainable food movement. Written by Pollan, a journalist, the prose is clear and entertaining, and the book is well-researched. The book is broken into three sections: One, Industrial (Corn); Two, Pastoral (Grass); and Three, Personal (the Forest). Through it all we follow Pollan from meal to meal, through encounters with various kinds of farmers and farming. If you've read the book before, this is a great chance to revisit it and see how it has stood up over the past six years. If you're reading the book for the first time, then you're in for a treat. Please feel free to read as much or as little of the book as you want. You don't have to read everything to come to the book club! Meetings are open to all – whether you finish the book or just have fresh ideas about our food system. This is an informal group-led discussion, with no designated speaker. Also, if you can't make it right at 6:30 p.m., please feel free to join us at any point in the evening! LHC asks that you pre-register for the free event (you can call them at 612-922-1159), but if you haven't pre-registered, please drop in anyway! There will be some light refreshments provided. We hope to see you there. See the Linden Hills Co-op event listing here.